In a house on a hill lives Jenny, a mother with three daughters, Donna, Chona, and Cherry. The sisters—aged 7 to 11—love school and have big dreams of being a doctor or teacher one day. Every day, the sisters attend to homework and household chores. The eldest, Donna, helps her mother cook and tend to their garden. Up close, it is every bit a mother’s dream—a household of happy little helpers, hard workers, and eager learners. But stand back a bit and you’ll find this idyllic picture is really a story of a harsh and difficult life. Abandoned by the father, the children and their mother live in a house that was once no more than a pigsty. Jenny, who works as a field hand for P100 a day, is half-blind with an eye condition still in search of a name and a cure. Her children go to school and are teased for having no lunch or money. Eldest sister Donna goes classroom to classroom selling candies hoping to turn a profit to pay for materials needed for school projects and presentations. 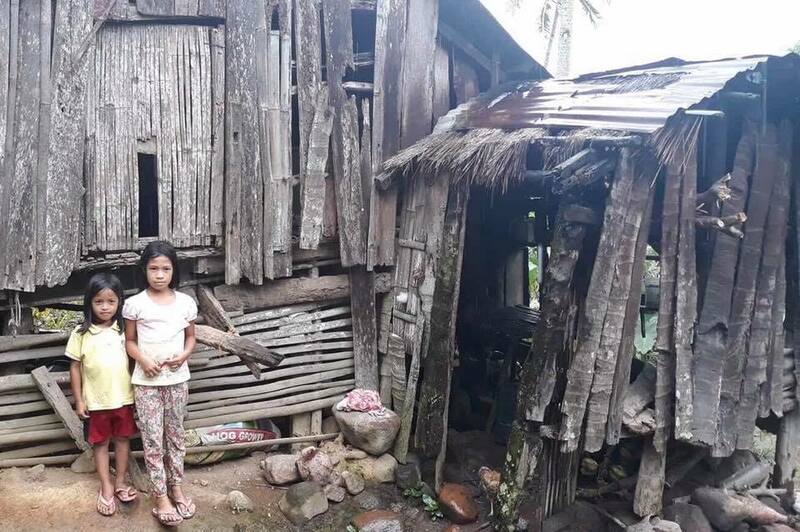 As part of an indigenous community, they live on their ancestral domain in the mountains of San Carlos, Negros Occidental. There is available land, but not enough resources to go beyond subsistence farming. Many days, there are only peanuts and boiled bananas to quiet empty stomachs. The sisters have become so accustomed to going hungry and consider themselves lucky to have more than one meal a day. Yet, without even a birth certificate to their names, the children go to school each day with an eagerness to learn that beats in them like another heart. Many days, there are only peanuts and boiled bananas to quiet empty stomachs. This was the state we found the family in just half a year ago. And to think we were not even supposed to have met them! NVC’s LoveBags initiative, which provides students in poor, remote locations with a year’s worth of school supplies in a sturdy backpack, mainly targets indigenous children because they are frequently underserved by local government. But the girls’ school wasn’t part of our list. However, the universe plotted to have NVC drop in on them and also provide LoveBags in the area. By this time, we had already distributed 4,000 LoveBags in a 2-year period, but this was the first time that a student walked up to NVC’s field officer, without prodding, to say thank you. This child was Donna. Moved by her gratitude, our field officer instinctively felt that she needed to find out more about Donna and followed her home, where she met Donna’s family. …this was the first time that a student walked up to NVC’s field officer, without prodding, to say thank you. This child was Donna. Mother Jenny recounted how her children would pray tearfully every night for the chance to remain in school. Cherry, the youngest, lived in fear that a wicked witch would one day break into their dilapidated pigsty and spirit her away. …donations from all over the country and some parts of the world came trickling in. And last January 2019, Jenny received a start-up piggery for an alternative livelihood that will soon augment her paltry daily income.